Roy Breiman is best known in the Seattle area for his work as a chef and executive at the Salish Lodge, Edgewater Hotel and, now, Cedarbrook Lodge. But his roots are in California, and that is his focus with co-author Laura Smith Borrman in Wine Country Chef’s Table, an exquisite new wine country cookbook from Lyons Press. This culinary adventure travels through the famous towns of Northern California’s wine country, including Healdsburg, Yountville, St. Helena, Calistoga, Sonoma and, of course, Napa. They profile 50 restaurants and provide recipes from each. Each town is themed, with Healdsburg featuring appetizers, Calistoga showing off soups and signature dishes, Sonoma offering salads and small plates, Napa providing main and side dishes, St. Helena contributing local favorites and Yountville focusing on regional specialities. A section called “County Line” takes in several other Sonoma County communities and includes desserts and other finishes to meals. In the section on Yountville, one might find it an oversight that the famed French Laundry is not featured. However, the authors include French Laundry owner Thomas Keller’s two new Yountville restaurants, Ad Hoc and Bouchon. I’m especially interested in trying the recipe for Baba Ghanoush from Brassica in St. Helena (which has since been rebranded as a new restaurant). And the Limoncello Fromage Blanc Cheesecake from John Ash & Co. in Santa Rosa looks amazing, though I’d prefer someone make that one for me. The Raspberry & Russian River Pinot Noir Sorbet from Zazu Restaurant and Farm near Santa Rosa sounds delicious and would be simple to make. 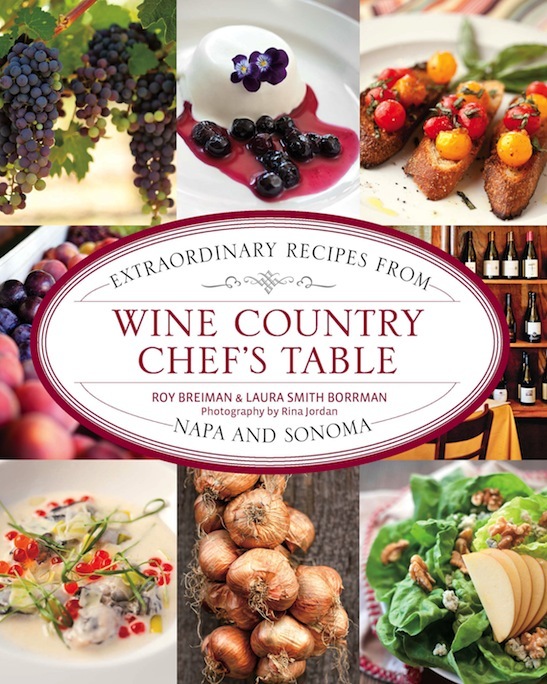 In addition to the restaurants, several wineries and farms also are featured throughout this wine country cookbook. The book is beautifully photographed by Rina Jordan. Even if your focus is on Northwest wine and food, this is a wonderful book to have or to share – and it supports a couple of Seattle authors. Wine Country Chef’s Table: Extraordinary Recipes from Napa and Sonoma, $25, 208 pages.